She's one super lucky fan. 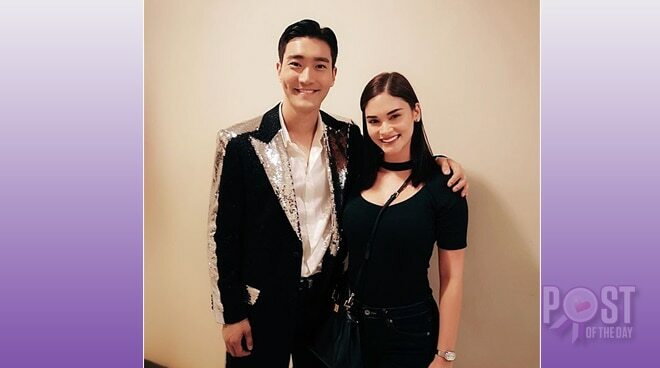 Having been a fan of Super Junior for years now, Pia Wurtzbach couldn't contain her happiness as she got the chance to meet her bias and favorite member Siwon Choi after the Kings of K-Pop's jam-packed show at the Mall of Asia Arena. "Finally, a true fangirl moment for me," she wrote in the caption of her photo. Apart from scoring a snap, the former Miss Universe also felt how truly special she is as she also got a shoutout from Siwon onstage. IDK WHO’S LUCKIER, SIWON WHOSE FAN IS A MISS UNIVERSE 2015 OR PIA WURTZBACH NOTICED BY HIS ULTIMATE BIAS!!! Siwon and Pia started to become friends after the latter won the Miss Universe 2015 competition.